I’ve wondered how this program came into existence and how the money is spent. I did the research to make this a “cliff notes” guide to the Federal Duck Stamp. If you are like me then you’re wondering things like; Why did it come about, Where does the money go, How do they find the artwork, and Why did the price increase. If you would like to see the U.S. Fish and Wildlife Service webpage for the Federal Duck Stamp, the link is HERE. Why did it come about? When this country was settled, there was abundant wildlife to go around for everyone. But as you can tell, the population increased to a point that land and resources became precious. As the population spread from the Eastern United States to the Western Territories, the wetlands that were stopping grounds for migratory birds were drained in order to feed and house the population explosion. During this period, market shooting for restaurant food, bounty hunting, and the collection of feathers for the fashion market nearly wiped the plentiful game from the face of North America. In 1934, the father of the National Park system, President Franklin D. Roosevelt signed the Migratory Bird Hunting Stamp Act. This act stated that any waterfowl hunter 16 years of age and over must buy and carry a Migratory Bird Hunting and Conservation Stamp on an annual basis. The reason that the Federal Duck Stamp Program has been called the “most successful conservation program ever initiated” is because 98% of every dollar (or $24.50 per stamp) goes directly to the conservation of wildlife habitat. Since 1934, approximately $800 million have acquired over 6.5 million acres of habitat. How do they find the artwork? The first Federal Duck Stamp was designed by J.N.Darling, who was a political cartoonist and chief of the Bureau of Biological Survey. It was opened up to noted wildlife artists afterwards. Then, in 1949, the first Duck Stamp art contest was opened to any U.S. artist who wanted to enter. This is still the only art competition of its kind to be sponsored by the U.S. Government. If you want to enter this prestigious contest, the link is HERE. Why did the price of the stamp increase? 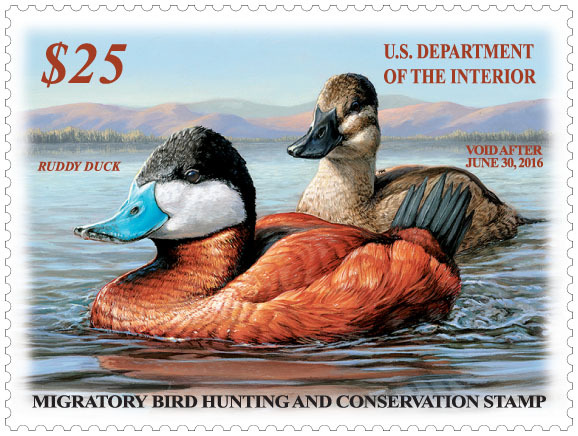 The increase to $25 that hit us this year was the first increase on the Federal Duck Stamp in more than 20 years. The extra $10 per stamp that is generated will protect an estimated 17,000 more acres of habitat every year. All of this information is from the U.S. Fish and Wildlife Service and can be found on their website. Like, Follow and Share us with your friends!